The Smartphone is the modern innovation that has changed the way of living and thought of business worldwide. Nowadays, when Smartphone users are able to receive medical assistance and get hot dines after a few screen taps, it seems obvious to count taxi service of the same comfort-ability. 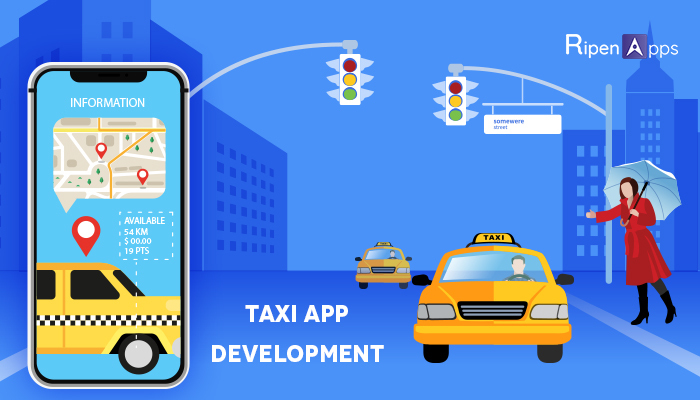 Here arises the need for Taxi App Development, because we bet you experienced this annoying situation when you can’t get a taxi for really long. The people who live in the city face heavy traffic and a limited number of parking slots around the town, prefer renting cars or calling a taxi or using public transport or riding bikes rather than buying their own cars or vehicles. What if you get your taxi at your place on a single tap of mobile? Isn’t sounds great? Well yes, this is possible via taxi-booking apps and this is the main reason why taxi booking app development now appropriately adopted like never before and seems to be the very promising direction for business to unfold in the condition of cosmopolitan cities. Well in this blog, we’ll talk about how to build taxi booking apps, how much does a taxi-booking app like Uber cost and a few more related queries in the course of the text. Are You Considering Developing An App Like Uber? Uber that has started taxi booking through the convenience of mobile application wherein people need not worry about traffic and parking space, we just have to sit back, get relaxed & enjoy the experience of the personal car without bearing the expenses of owning a personal car. Uber has rightly been regarded as one of the most successful billion-dollar startups in the current era. Eight years ago when Travis Kalanick & Garrett Camp founded this company in March 2009, even they wouldn’t have expected that it would turn out to be such a famous business enterprise. According to the latest survey, the last update in September 2018 states that Uber has 75 million riders across 600 cities, covered 78 countries worldwide. Uber’s success story motivates a lot of business startups, entrepreneurs or individuals to think about launching their startups with similar idea approaching different taxi booking app development companies to make it in real. Let’s explore the taxi booking app development process, app development cost, and see if another Uber clone would worth the cost. It is quite mandatory to look over the revenue growth rate of the industry in which you are going to invest, Taxi booking industry is growing like a fire and this enables ventures to opt this field as their business to make more money & popularity. Revenue in Taxi Sharing Industry: $59,678M in 2018. The Annual Growth Rate: Revenue is expected to show an annual growth rate (CAGR 2018-2022) of 16.3%, resulting in a market volume of $109,050M by 2022. User Penetration is 9.8% in 2018 and expected to hit 13.3% by 2022. The average revenue per user (ARPU): Currently amounts to $118.28. Higher Revenue Generated Zone: In global comparison, most revenue is generated in China (US$29,749m in 2018). User Request: A user request for a taxi or cab on the basis of availability and type required. The details are automatically sent to the nearest driver. Driver’s End: The driver has the option to either accept the ride or decline it. If he declines it, the request will be passed to any other driver. Tracking: User can track the car on the real-time basis and can get to know about the estimated time of arrival. Payment: Passenger can pay either in cash or through the cashless system as per their convenience. Another good feature is passenger can estimate the total journey fare in advance. Rating: Lastly after ride completion, the driver is rated by the passenger on the basis of certain factors. Well, this was the concept that Uber featured in their processing. When we are talking about the app like Uber, always keep in mind that Uber and other taxi booking app use two different kinds of apps and i.e. Passenger App & Driver App. Like any other Application, Taxi booking apps have also some essential elements and Uber, like apps have three components i.e. Customer Side, Driver Side, Admin Panel. To building Uber, like app one has to develop three apps and that are Passenger App, Driver App, and Admin App. As the name shows the passenger app is for users who book the taxi. Have a glance at the basic features of passenger app essentially needed. Login Or Register: Easy to login via email, social media logins, accounts etc. Book a Ride: An interface to set the pickup & drop location, call a taxi, select type of cab. Contact Driver: Coordinate a pickup location by calling the driver. Track Driver’s Location: Track the driver’s real-time location through GPS tracking. Price Calculator: Check the estimated cost of a ride from start to end point. Payment Option: In-app card payment via credit or debit, if not this, pay cash directly to the driver. Cancel Booking: Customer can cancel the booking anytime in case of any plan changes. Push Notifications: Keep your users updated on order status, expected time for taxi arrival, car model, drivers name etc. Trip History/ Ratings and Reviews: Verify booking history, messages, ratings & reviews etc. Simple Registration: Drivers can request a signup and add the necessary details. Real-Time Requests: Drivers get notified for new ride requests with all the pickup details. Accept or Decline: Drivers can accept or decline ride in the limited time frame. Trip Information: Drivers get the pickup and drop inquiry about their passenger. Contact Passenger: Drivers can make calls to the passenger to clarify pick up location. Start/End Trip: Drivers can start & end the ride to generate the automated bill. Track Earnings: View entire job history and daily earnings. Provide help & support to passenger and driver. Registration includes Creation of profiles & registration. Creation of user’s profile or registration is a must-have component for both driver & Passenger side of the application. At the time of customer login, you will be focusing your concentration on attaining the data related to their phone number, email ID, or Name. The Data which you are gathering from the drivers will be a lot more extensive. For the Driver, you may ask the photo ID, license and all necessary identification. You may also implement the rating and feedback section to enhance the customer’s satisfaction and ask them to rate the ride and behavior of the driver. Identify Device Location: Through GPS, users don’t need to fill their details again and again. This feature enables to fetch the precise location of the user by using Map Functionality. To Give Driving Directions: To present driving routes including each turn, there are platform-specific APIs offered by Android & Apple iOS. Android gives direction specification from Google maps while iOS has developed Mapkit to provide directions. For the proper execution of the ride, the passenger & the driver need to be connected with each other to know each and every detail about the ride. Through this feature you can know the estimated time of arrival, send updates in case there any delays increases. One way is calling and another way is messaging or push notifications to notify the driver and the passenger about the ride. Through this user get a popup related to their ride whether the app is running or not in the device at that time. The best selling point of Uber-like App is the ability to send and receive the payments from within the mobile app along with the advantages of viewing the ride’s cost estimated on the app screen. To enable this feature in your taxi-booking app, you will have to make use of third-party payment gateways integrations. There are various integrations that are most commonly used by taxi booking app development companies including, Apple Pay, PayPal, Google Wallet etc. Taxi app development is rather expensive. Your ambition will definitely come at the price, but there are ways out. It always good to launch an app with the minimalistic set of features within Phase I and keep enhancing the features and functionalities within it with each upcoming version. An app like Uber as in stage today, shall cost on the higher side i.e. between 50K to 60K in USD and timeline required would be around 5 months, however, the same shall be achieved within milestones by launching it in the versions. You shall start with a minimal prototype for around 15K to 20K in USD and this would have all the features to stand in the market and serve its users and with the time we shall enhance the same based on user response. This can be achieved in 7 to 8 weeks. The majority of key activities depends on you, even development to some extent. There are a lot of taxi app development companies to hire across the globe. Choose those you like, opt based on estimated cost and go ahead. Make your comfortable taxi services be closer to people within reach of the hands of the user.